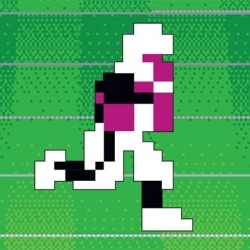 Video game athletes have probably never been made better than Tecmo Bo (Jackson), though you can't say the same about the graphics. When I was growing up, I was a self-confessed reset button pusher. It started out on Nintendo during games of RBI Baseball and Tecmo Super Bowl. It then got really bad during my Sega days with NHL and Madden (yes, I was a sports gamer). Good game or bad, and much to the frustration of my friends, there was always something appealing about starting fresh. A new game meant new possibilities and new potential, playing with the all-time legends and recreating the most memorable moments. Regardless of whether the previous game was good or bad, the next one was always going to be the great. My video game avatar has long since been retired, but it's no surprise that the beginning of a new year always seems to get me thinking about the reset button. A new year is not a reset button of course, but a lot of time it offers the very same promises of possibility and potential. New resolutions, new goals, and the opportunity to build on good or to start anew. By and large people seem to be more invigorated at the start of a new year, and being surrounded by invigorated people can be, well, invigorating. As we head into our second full year at Sequence, I'm not sure we can be much more excited for what lies ahead. Just around one year ago Lizz and I sat by ourselves at makeshift desks in a disheveled office. We were fortunate to be prepping for a busy winter calendar, but we were working hard to get Sequence up and running. Starting from scratch was incredibly rewarding, but it wasn't easy. Fast forward 12 months and we are prepping for an even busier winter and a move into larger office space. Our event travels have already taken us to Chicago, San Francisco, Milan and Jakarta, with 2013 promising more of the same. Best of all, I am surrounded by six incredibly bright and talented people, which means my most difficult job is usually just trying to stay out of the way. We have a number of initiatives that we're looking to roll out in the coming year, the first of which is our blog. As Sequence continues to develop and grow, it's equally as important that we open ourselves up. We want people to understand who we are as individuals, and who we are as a company. What makes us laugh. What makes us gripe. What inspires, intrigues and excites us. What motivates and what drives us. What makes us who we are. What makes us Sequence. We hope you'll check us out from time to time and let us know what resonates for better or worse. Most importantly, we hope you take the start of the new year to do as much resetting as you need to allow you to stay fresh, invigorated, and happy. Wishing you all the best for a fantastic 2013.